We did not, we think, have to overtax our minds for an idea for the cartoon on this month’s calendar. “Sacktime” we think [is] very appropriate. We venture to state, that this month, as far as the operational angle is concerned, our combat men did garner some free time. And all because of what? This goldarn English winter weather. Many a day we chaffed at the bit, hoping that we would get a break and it would clear allowing us to be aloft doing our share to shorten the fracas on the Continent. We are not apologizing for 13 Sorties, as far as we are concerned the more times we are airborne the better we like it. Well, let’s see these 13 Sorties and what we accomplished. Sortie 126, 3 October, we dispatched 1 A/C under the leadership of CAPT CLAGGETT to attack the DAIMLER BENZ FACTORY at GAGGENAU, GERMANY. This factory is responsible for the manufacturing of heavy trucks, gun tractors and other mobile equipment. Our ten A/C were over the target, but due to intense smoke obscuring the MPI, our 108x500 M17’s were dropped just short of the target. Our old friend PADERBORN A/F was to feel the brunt of our A/C on 5 October, Sortie 127. 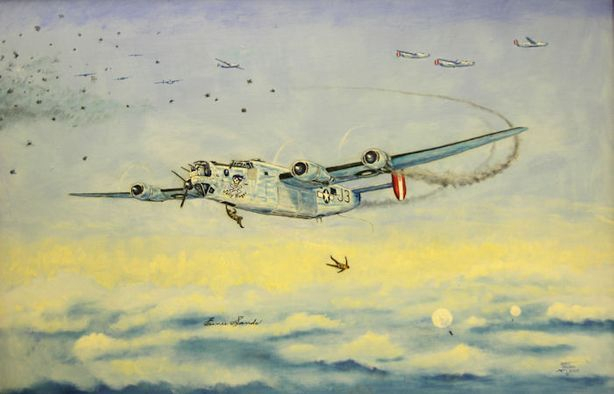 Twenty-three of our A/C were over the target under the leadership of COL ISBELL and MAJOR BETZOLD and CAPT QUINN, dropping 264x500 GP’s with the following results: bombing was visual and crews report very good results with hits on MPI and target area well covered. Strike photos confirm crew’s reports. Another milestone on the way to Berlin. A target new to us was our assignment on 6 October, when we attacked the WENZENDORF & STADE A/F in GERMANY. Our formation of 27 A/C was led by MAJORS WILLIAMSON (left), JAMISON, and MARTIN. 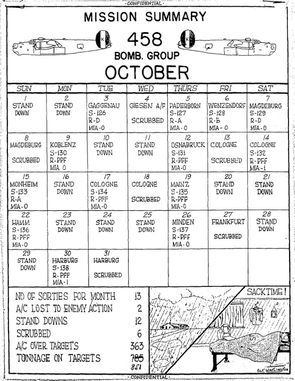 Our total bomb load of 288 M17’s & GP’s were dropped with the following results: Two sections of 9 and 8 A/C respectively bombed the Primary at WENZENDORF visually. SAV photos show the first section hit just west of the MPI in smoke of previous group with possible damage to hanger in that area. The second section’s bombs fell on the airfield itself. 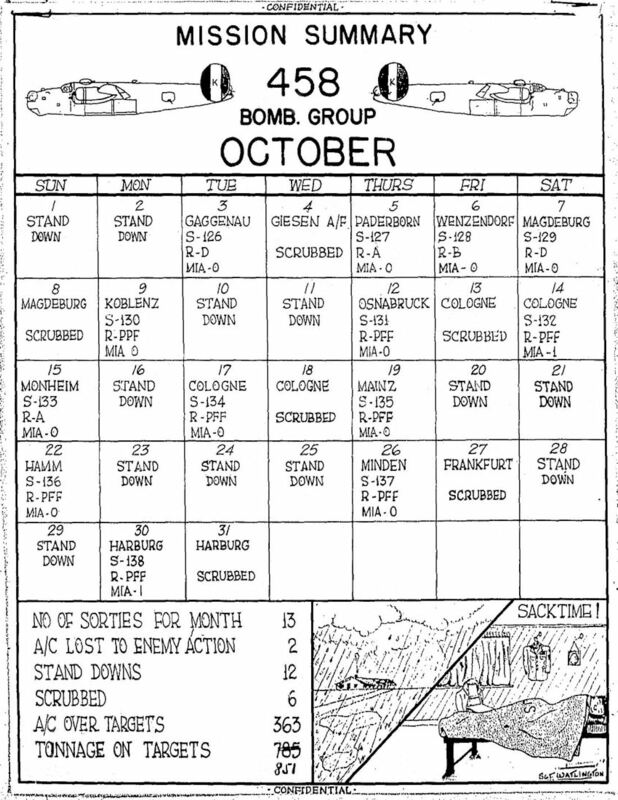 One section of 9 A/C bombed the secondary, STADE A/F, dropping incendiaries visually. The majority fell short and into the grass field with a few stringing over into a barracks area. Still continuing our assault against the Hun’s oil productions, we attacked the ROTHENSEE OIL REFINERY at MAGDEBURG on 7 October. 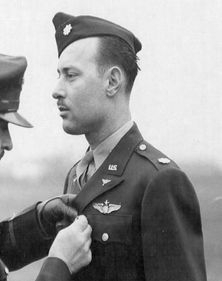 Our formation of 29 A/C was led by LT COL O’NEILL, MAJOR BETZOLD, and CAPTS WRIGHT and CLAGGETT. Twenty-four A/C hit the Primary, dropping 136x1000 lB GP’s with poor results. 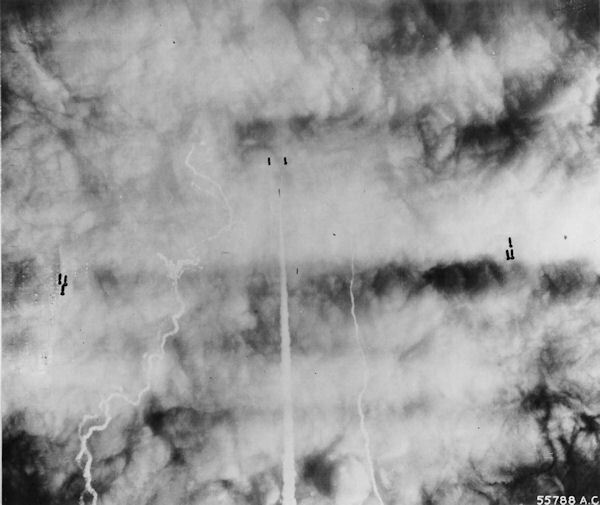 Five other A/C hit a Target of Opportunity near HENGELO, HOLLAND with poor results, dropping 30x1000 GP’s. The much-battered city of KOBLENZ was to be our victim on the 9th, our MPI being the M/Y of this once great city. Twenty-nine of our A/C were over the target led by MAJORS MARTIN, HENSLER, and CAPT QUINN. The formation bombed with the aid of PFF equipment, dropping 299x500 GP’s with unobserved results. Sortie 130 on the black side of the ledger. On the 12th, 20 A/C under the leadership of CAPTS SPEER and CLAGGETT were dispatched to attack the M/Y at OSNABRUCK in an effort to hinder the Hun’s transportation problem. No clear and sunny day was this, so we all knew that PFF would have to be employed. Nine A/C bombed on PFF, the other 11 A/C could not find the target due to the 10/10ths clouds, so did not bomb. Total bombs dropped on this day, 466x100 GP’s. In another attack on the oil production facilities of the Boche, we attacked the OIL REFINERY at MONHEIM on the 15th. Eighteen of our A/C were over the target led by MAJOR JAMISON and CAPT CLAGGETT, whilst 6 A/C were crowded out by another group on the bomb run and did not bomb. 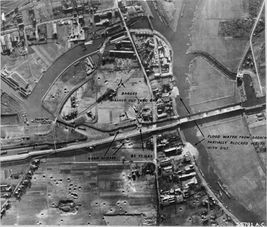 Bombing was done visually and 379x250 GP’s were dropped with the following results: three squadrons, 6 A/C each, attacked MONHEIM REFINERY visually. Crew observations were hampered by cloud cover, but three large explosions and resulting columns of black smoke were reported. SAVs confirm explosions and fires despite scattered pattern. A good job well done and a job to be proud of. 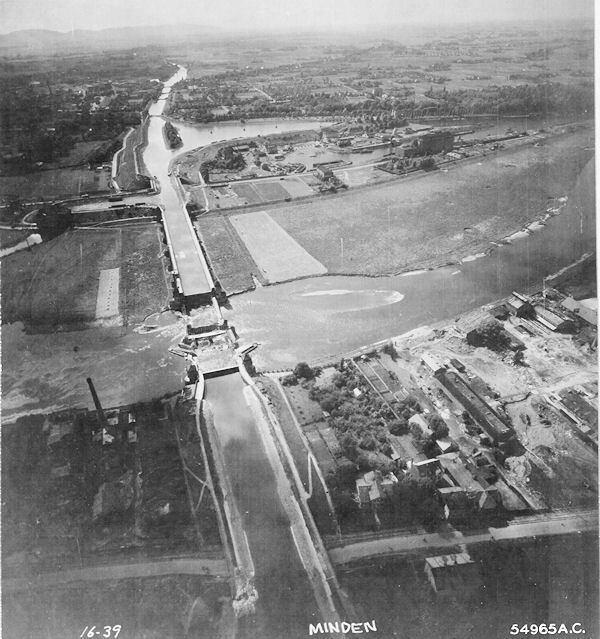 Still plugging at the transportation system of the Hun, we were again airborne on the 17th to hit our old friend the M/Y at COLOGNE. 33 of our A/C led by MAJOR WILLIAMSON and CAPT WRIGHT bombed the Primary through PFF equipment, dropping 189x500 GP’s and 180 M17’s with unobserved results. Another M/Y, this time MAINZ, was our target on the 19th. Old Juniper Pluvious had been dogging our footsteps in our last few missions and once again was playing havoc with us on this day. 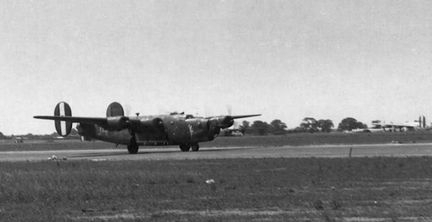 PFF was again used by the formation of 20 A/C led by CAPTS WRIGHT and BREVAKIS; 224x250 GP’s and 108x500 M17’s were dropped with unobserved results. 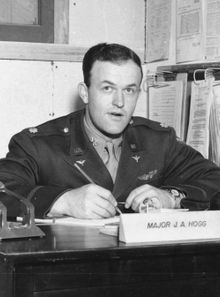 LT COL HOGG (right) and CAPT CLAGGETT led our formation of 23 A/C in an attack on the HAMM M/Y. It was the same story, clouds and more clouds obscuring the target, thus necessitating the use of PFF equipment. Total bombs dropped on HAMM was 332x250 GP’s and 81x500 M17 incendiaries. With the rail transportation of Germany being pounded daily by the Allied forces, the Hun had resorted to the extensive use of his great canals as a substitute for the battered RR system. 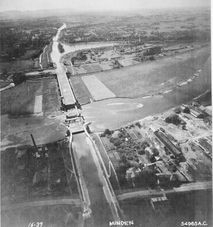 As always, our military intelligence “were on the ball”, so on the 26th of October, we were assigned the important task of giving “Old Schikie” another headache by attacking the AQUEDUCT on the MITTELLAND CANAL at MINDEN. Although our formation of 29 A/C led by MAJORS DARELIUS, BETZOLD and CAPT QUINN bombed through PFF, dropping 87x2000 GP’s on the target with unobserved results, later photo reconnaissance shows the attack on this target was devastating. 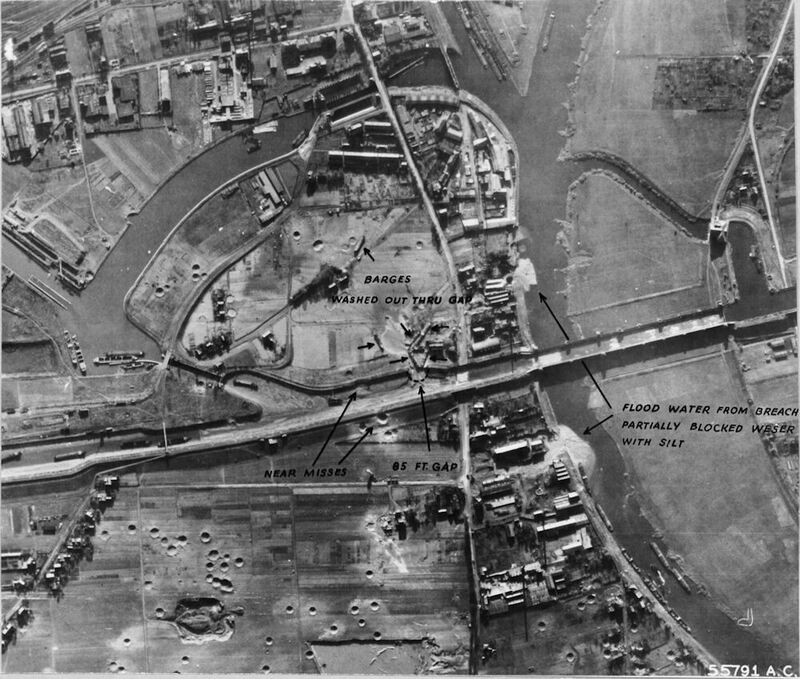 Although our bombs were not plotted, the 2nd Bomb Division’s results (in which we took part) were as follows: a 2000LB direct hit tore an 85 foot breach in the canal wall at a key point where the waterway stands over 20 feet above the terrain. Water rushing from the canal swept four huge barges and a tug boat into adjacent fields – one at least 200 yards from the canal. Two and half miles of the canal were drained, and at least 15 barges and tugboats are stranded without a drop to float on. A minimum of several weeks, it is estimated, will be required to repair the breached wall. This is an excellent example of instrument bombing and our navigators, Mickey operators, and bombardiers are to be commended on this excellent job.